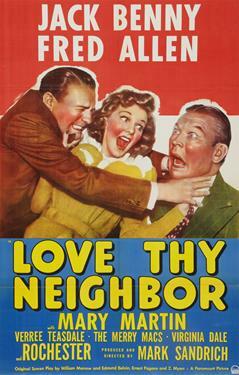 Playing off the contrived feud between Jack Benny and Fred Allen, the two funnymen star as themselves in this meta-comedy. When Jack falls for Fred's niece, Mary, all hell breaks loose as the two men grapple for the upper hand. Mary tries to mend the rift between the men, contriving wild scenarios of life-saving and selflessness, but the periods of agreement are fleeting, as the rivals cannot seem to get along. A series of mad mishaps and confusion follows.